Geez, some of these Sony reissues have way too many labels involved! 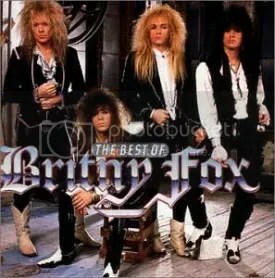 Britny Fox seems to be one of the most popular of the less successful glam bands (if you categorize having a debut go gold as being “less successful”). It’s not hard to see why they’re popular amongst hair band aficionados — they have a similar sound to Cinderella (both bands came from Philadelphia). They aren’t as bluesy as Cinderella could be, but Dean Davidson is a dead ringer for Tom Keifer at times with the same screechy, gritty voice that is often considered the stereotypical hair metal vocal style. This is my first and so far only Britny Fox album, though I’ve planned on picking up their first three releases for years. I just have never gotten around to it, for some reason but this greatest hits compilation has tided me over quite well through the years (“Girlschool” being one of the best songs to ever come out of the glam scene). One of these days, I’ll get around to picking up a few of their albums! By the time this greatest hits album was released, Britny Fox only had three albums under their belt. The first two, Britny Fox and Boys in Heat, are covered but the third release (1991’s Bite Down Hard featuring new vocalist Tony Paris) was on Atlantic/East West Records, so that material is absent.